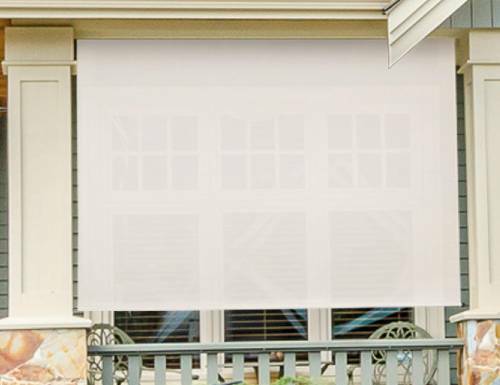 Each exterior solar screen shade comes with outdoor grade screen fabric and components. These outdoor sun shades are ideal for blocking UV rays, providing shade while not blocking the view. Choose from our different colors as UV blockage. The tighter weave screen fabric will block more light but also block more view. Each solar screen shade comes standard with either a 4, 6 or 8 feet headrail with the fabric almost 2" narrower, no valance included. The drop or height of the exterior shade screens is 6 feet. Cord lift control is available on the right side of the shades only but may be moved to the other side. Our outdoor sun shades come with metal ring tie downs to hold the shades in place in the wind. W: 48" 49" 50" 51" 52" 53" 54" 55" 56" 57" 58" 59" 60" 61" 62" 63" 64" 65" 66" 67" 68" 69" 70" 71" 72" 73" 74" 75" 76" 77" 78" 79" 80" 81" 82" 83" 84" 85" 86" 87" 88" 89" 90" 91" 92" 93" 94" 95" 96" 0/0"1/8"1/4"3/8"1/2"5/8"3/4"7/8" H: 72" 0/0"1/8"1/4"3/8"1/2"5/8"3/4"7/8"
Before ordering the exterior solar sun screen, I need to know what the depth of the clutch bracket is, to be installed as a ceiling mount. I only have so much to work with. The Exterior Solar Screen shades bracket is 3" so you'd need just that amount of space for the bracket however the roll will be bigger about 4" depending on what height you get. Like your blinds, these were a perfect solution for a lanai. Like your blinds, these were a perfect solution for a lanai. Easy to install, attractive, easy operation, and filters the sun just the right amount, as advertised. I have ordered 2 different kinds of blinds and the shades from you. The orders came promptly and perfectly sized. FINALLY a company that deserves top ratings in all areas. Love the blinds. Only problem is that on a very windy day, The hold down rings in bottom of blind came away from the bottom rail after end cap blew off. Called to get more hold down rings and received a set that is too thin and fall out of slot in bottom rail of shade. Would really like to receive that proper thickness to stay in the slots in bottom of shade rail. OMG why did I wait so long! OMG why did I wait so long!! Shade was exactly what I wanted it came in the promised time and works fantastic! It was super easy to install and I plan on buying another one. Thank you Blinds Chalet!